UNITED NATIONS, March 24 -- While the UN Visitors' Lobby throbbing with the sounds of African drumming on Tuesday night, questions about the event's sponsors went unanswered. Secretary General Ban Ki-moon spoke of the talking drum, but officials of his UN Department of Public Information declined to explain the role of the World Harmony Foundation, the longest acknowledgement in the brochure DPI produced for the event "with the gracious support of the Ministry of Culture, Cameroon." To the sides of Ban Ki-moon's rostrum were not only diplomats from Cameroon, but also self-described Chinese businessmen, doing interviewed with CC TV. Inner City Press asked a senior DPI official, who are these sponsors? You'll have to ask Cameroon's delegation, was the answer, they're the one's we deal with. Follow-up inquiry led to two answers: "the Chinese guys are the sponsors," and for anything more to look at the World Harmony Foundation's web site, www.whf-foundation.org. The problem is, the web site of this sponsor of a UN event has no information on the pages for Board of Directors or even "Sponsors." Under "Our Sponsors," it says "will be listed soon, currently being updated." Under board of directors, it says "page is being updated, sorry for any inconvenience." Some say it is all too convenient. The sponsor, it appears, is "Under Construction." Another UN official in charge of the event said that only upon arrival did he realize "something was weird," and ask about the co-sponsors. He hearkened back to the last UN Staff Day, in which this same World Harmony Foundation brought a team of acrobats from China for an event in a less than half filled General Assembly Hall. Inner City Press asked, what are these sponsors looking for? A photo with the Secretary General, was the answer, or a UN award they can use for prestige in their private business. One of the "Drums" event's sponsors is listed as the "recent recipient of the 2009 Millennium Development Award," but sources connected with the event earlier this month say this is not at all clear. That event was sponsored mid-coup by Madagascar, awards were handed out to people not even on the program. Tuesday's program gave a "very special thanks" to "Ms. Loula Loi Alafoyiannis, Euro-American Women's Council, for her tireless efforts." Close observers of this murky world at the UN's edges where it interfaces not only with NGOs but also with business say that former UNEP director Noel Brown is looking for $180,000 a year as the part-time director of an affiliate, the World Harmony Alliance. How these entities raise and make money is another question, for another column. The actual drums, it must be said, were impressive and well-played. Reportedly they were flown in on a separate cargo plane, and ran into problems at customers. There were tam-tams and tambours; there was the Ambassador of Sudan, slated to dine that evening with joint African Union - UN chief mediator on Darfur Djibril Bassole. 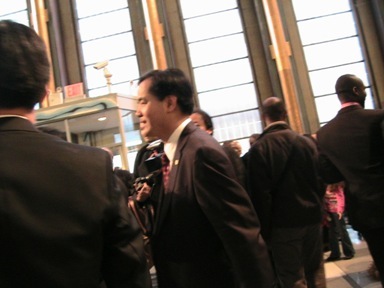 Among Ban Ki-moon's staff, Vijay Nambiar, Kim Won-soo and Lynn Pascoe were in attendance. Footnote: earlier on Tuesday, Inner City Press asked Ban Ki-moon if he intended on Wednesday to name American Peter Galbraith to the #2 UN top in Afghanistan. Tomorrow is the day, Ban said, while playfully declining to confirm that Galbraith has the post. The Obama administration has already told the media that he does, while denying they want to create and fill a Number Two slot in the Afghan government of Hamid Karzai. This seems to be their strategy, and how it will apply to UN headquarters is not yet known.